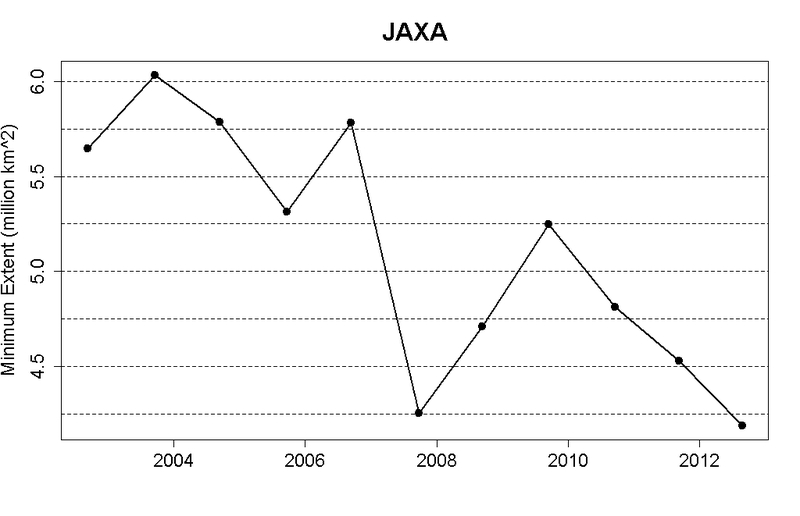 The mean date of daily minimum extent in the IARC/JAXA data is Sep. 15.5, the earliest is Sep. 9 and the latest Sep. 24. So we can expect *about* 3 more weeks before the actual minimum is reached. And we’ve already broken the record minimum for sea ice area. It’s looking more and more like this year will break the records for sea ice area, extent, and volume. For more information (including more broken records of specific data sets), see Neven’s excellent sea ice blog. Watts has already started with the low ice in the Holocene Optimum and it old Faithfull is still the Global Sea Ice which is only at fifth place. 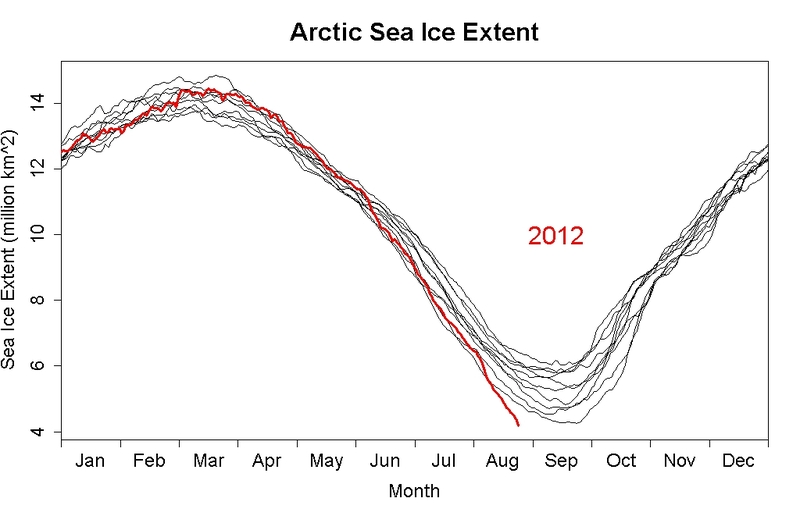 If the Arctic Ice tracks below 2007 through mid November, that too will also break. I sure Watts will call the hold thing a recover because it will be the large refreeze on record. Just love “Watts Up With That?” were reality is surreal! We should be ready for him this time with the Cryosat-2 satellite data available. Deniers have been dismissing PIOMAS as “only a model”, and sighing “where, oh where, is the satellite data we need?”. Now we can say “Here, and they show a volume decline year on year”. I guarantee that Cryosat-2 will be dismissed as too short a period to establish statistical significance, I’ve already seen this happen with Grace data. Apparently, in Fake Skeptic world, all evidence exists in a vacuum, so sea ice extent/area, PIOMAS, etc, can’t be used to corroborate whatever Cryosat-2 finds. I’m wondering if warmer waters will delay the date when the freeze starts or not. With the rapid fall in sea ice extent continuing so late in the season surely warmer than usual water temperatures are part contributors to this. Wouldn’t those same warmer than usual waters also delay when the freeze will start all other things being equal. The minimum may fall any time in quite a long period, so I wouldn’t expect the date of the minimum to follow a trend. But is the annual cycle shifting? A large part of the “open water” this year is still covered with bits of ice, so while I expect refreeze to be a little later than average, I don’t expect it to be as late as 2007. I think it’s hard to say, since ‘all other things’ are so rarely equal! Of course, both the last stages of melt and first stages of freeze are now happening in different geographical areas, much further North, so it’s not quite apples and apples. Best look at the refreeze date for fixed geographical locations. I was thinking just about this year rather than the trend. Tony seems to be strangely silent about the lastest turn of events. Although he does have the “arctic sea ice nearly disappears” countdown calender still up. But right now < 3m sq/k is starting to look reasonable. Thanks for your continued climate data analysis inspiration. Thanks for mentioning it on the ASI blog, Kelly. There are so many comments there right now that I didn’t bother to reply, but unlike TypePad, WordPress has these indented replies (or whatever the proper term is). Great work. I really like those animations and might make use of them when analyzing this melting season. Well, regarding IAXA lowest value, I’d wait till tomorrow, as usually (but not always), IAXA corrects its value upwards. Usual correction is of magnitude 50.000 km2, so it may turn out that today’s value would just miss record low by a tiny hair – it is rather unlikely, I do expect record to be confirmed but that is what I spotted (and as I see, Larry Hamilton waits for two days for results to stabilize just to be sure no more corrections are applied). Regarding today’s value of NSIDC, I expect another record broken by tomorrow. Although, the real question is that will extent go bellow 4.0 or not. It is hard to see how it cannot pass 4.0m. 3.5m is the next threshold and it could well reach that. Conditions are favourable to meling for the next week or so. Fingers crossed! One feels torn by this. On one level, it is great to dish the deniers, on another it opens another apalling vista. Deniers will never be dished. There brains are wired so that this cannot happen. It is far to fearful for them to change their reality. We need to quit trying to convince people that cannot be convinced and figure out a strategy that allows the climate to be stabilized. If this can only be done with their support, we better think of a win win solution. And after revision, the value is 4.209.219 km2, so here it is. I wonder, how long it will take to go below 4.000.000 km2. 2 or 3 days, I would guess…. I’m no expert and my thoughts are just intuitions based on graph eyeballing, but it does look like the yearly minimum has no shifting trend. Also, the melting/refreezing behaviour looks roughly simmetrical. So an early melting would imply in a late refreezing – which makes sense, in a warmer year. What also strikes the eye is that the melting shows no sign of slowing down until this point, suggesting the mimimum will be DEEP this year. I’m feeling bold today. I’ll bet the minimum will be 2.8 million km2, reached around Sep 20th. Sea ice extent will not catch up with 2007 levels until mid-November. These are certainly extraordinary times…. It is worth noting that NSIDC uses a 5 day trailing average, so even if extent levels off today the NSIDC figure will keep on going down. Is there really any doubt that we’ll break the Sept average of 4.3? There are still shares for sale in the Intrade market (less than 4.3 for Sept). All you fake skeptics, like J Martin, can say an ice free arctic won’t affect people, but you’re wrong. First, it’s a disaster for the whole globe in terms of climate, but that’s too technical for you to understand, apparently. So, maybe it will anger you to know that an old hippie tree hugger like me is making money off of people like you at Intrade. IARC-JAXA dived even lower today (25 August). From the chart it’s heading below 4m sq km very soon. Looks like a huge record decline could be in the making this year if it keeps up at this rate. Interpreting: the (sub? I don’t understand this prefix)area for August 19-24 has good predictive power for the eventual minimum extent, and based on the linear function shown we may pretty confidently expect a new extent record close to 3 million km2. Right? Keep in mind that if you did the same thing last week on Aug 18th, your estimate would have been 3.71+/- 0.25 million km^2. The decline in the past week has been incredible given the time of year: -634,000 km2 in 7 days or almost exactly double the rate at the same time of year in 2007 (-319,000 km2) and 40% faster than the previous JAXA record in 2008 (-458,000 km2). An ice free Arctic is unlikely to have any significant effect on anyone’s lives. On WUWT a couple of months ago I voted (if voted is the right word) for 4.3 lower even than your 4.55 Looks like we were both wrong. I think the Arctic is an irrelevance. It’s what the Sun is going to be doing over the next 20 years that is really interesting and will likely give you much in the way of interesting statistics to examine. I am a through and through climate sceptic just to remind you. Looks more like a blatant troll to me. Gareth Renowden actually predicted this kind of response here. It’s not warming. If it’s warming, that it’s not man made. Or maybe it’s irrevelant. Or maybe it’s too late. Anyway, the point is: whatever you do, don’t stop burning fossil fuels. You can figure out why later. NSIDC now also shows new all-time record low set yesterday, August 24, at 4.0892 million square km. It’s what the Sun is going to be doing over the next 20 years that is really interesting and will likely give you much in the way of interesting statistics to examine. I know what the Sun will do over the next 20 years. It will go up, then it will go down, then it will go up again, and then it will go down again. The Sun has an 11-year cycle, that changes its output by typically 0.4 Watts per square meter (peak to trough). During those same 20 years, we will get about .5 to .6 Watts per square meter of additional forcing from CO2. It will be upward forcing only. And it won’t come down for centuries. I’d be interested to know the answer to this question if anyone can help. Given that it takes eighty times more energy to turn a given quantity of ice to water at 1C, than it does to raise the temperature of same quantity water by each subsequent degree, would it not be the case that as the volume of ice in the Arctic diminishes, the faster the remaining ice will melt — because the available energy will have less work to do? Thus, in effect, we should expect to see the rate of ice melt tending to speed up its acceleration towards the summer minimum, the less ice is present. And would not the same effect then tend to delay the ice recovery? This positive feedback seems to be what is being observed in the Arctic ice graphs — though I might be being deceived by other factors of which I’m not aware. My two penneth. You are dealing with a surface effect here. If the exposed surface of the ice experiences the same temperature it will melt at the same rate. For a larger surface you get a larger melt volume affect. i.e. the heat is only effective if it has access. In a word no. Melting a given amount of ice still takes the same amount of heat and the sun is moving back down to the horizon so the amount of insolation is dropping. On the other hand as the ice thins a given area of ice has less volume so you could get an acceleration if there is a large amount of thin ice on the verge of disappearing. NSIDC extent record broken. From Nevin. Now NSIDC has broken through – down to 4.08920m sq km. – cf 2007 low of 4.16. (from Neven’s blog). And no signs of slowing down yet! You can find a rather clever, if that is the right word, argument from the deniers on the Swedish blog The Climate Scam: since the current melt is much larger than most climate models predict from AGW it can’t be due to AGW but has to be a natural fluctuation. When it comes to global temperature, on the other hand, the same guy argues that since the warming the last 15 years has been somewhat less than models predict the models has to overestimate climate sensitivity. … and therefore, it’s not warming, but the warming is due to sunspot activity. This would be the same cesspit that spawned the likes of Jonas N and Olaus Petri who were too scared to enter into a rather sunstantial wager with me at Deptoid regarding the continued trajectory of the Arctic sea ice. I suspect that they are now thanking their lucky stars for their cowardice, and that there is no hint of registration of the cognitive scotoma that inflicts their understanding. And if there is, then said personages are nothing less than genocidal maniacs. I like the ‘heads I win, tails you lose’ element in this Swedish strategy– it’s a perfect miniature of denialism in general. And Tony finally remarks on the new record low. His reply? “No, it’s not happening, it can’t be global warming, NOOOOOOOOOOOOOOO!”. Shame on me for letting Rattus make me take a look. There is not one second spent at WUWT that is not wasted. 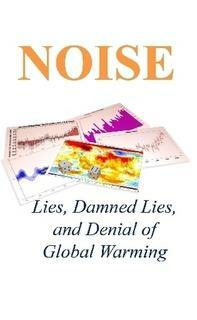 The intellectual bankruptcy, depth of denial and the scientific illiteracy there just seem to get worse all the time. I guess that makes sense. As things become more and more obvious and more and more impossible to deny, the denial potentiometer will need to be pushed beyond any previously explored limit. Yes, it will have to be turned to “11” or maybe “13”!